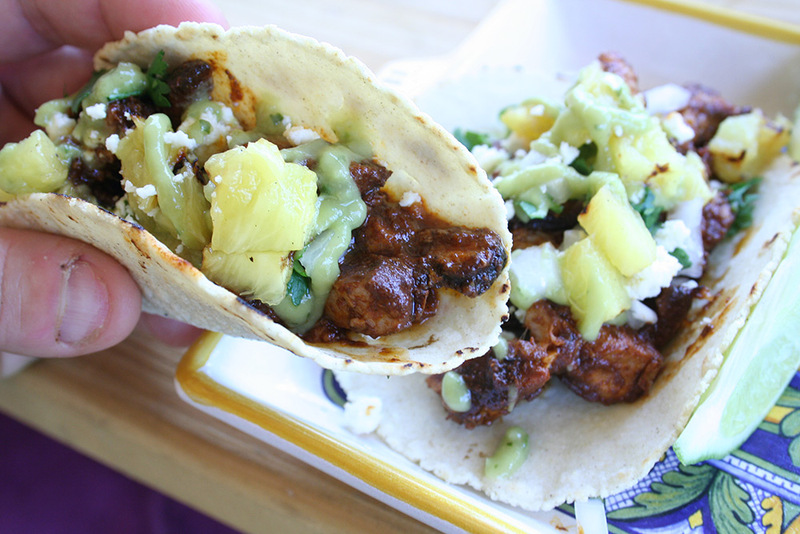 Slowly simmered Pork spiced with chili peppers, then grilled along with pineapple. 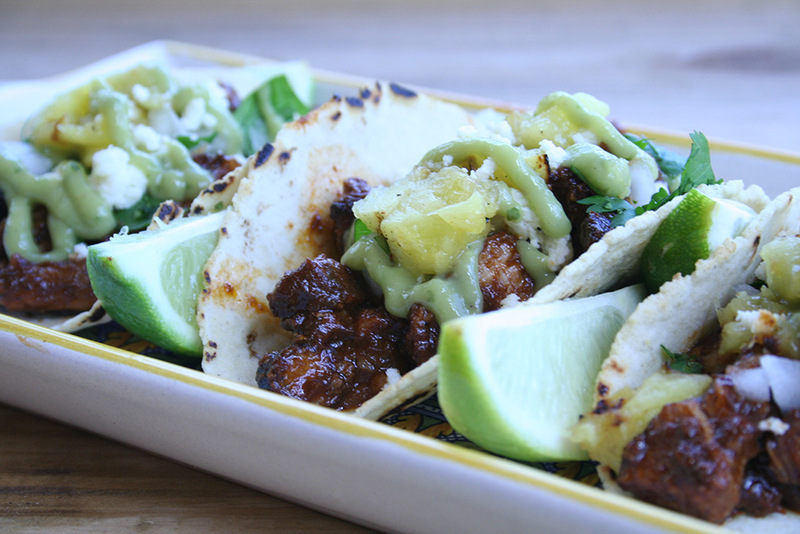 Tacos Al Pastor are tacos that we’ve had in Tijuana and Ensenada. Large quantities of spicy marinaded pork are piled onto a rotisserie and topped with pineapple. Flame broiled and carved directly into a fresh corn tortilla. Check it out. It’s really special. It’s not so easy to replicate. We’ve tried over the years with no success. So I was looking through the newest Cooks Illustrated magazine and there was a recipe that promised to be as close as you can get without a rotisserie in your kitchen. Well here’s that recipe. I’ve altered it a little, but not much. I’ve added a few extra garnishes. Queso fresco and avocado sauce. 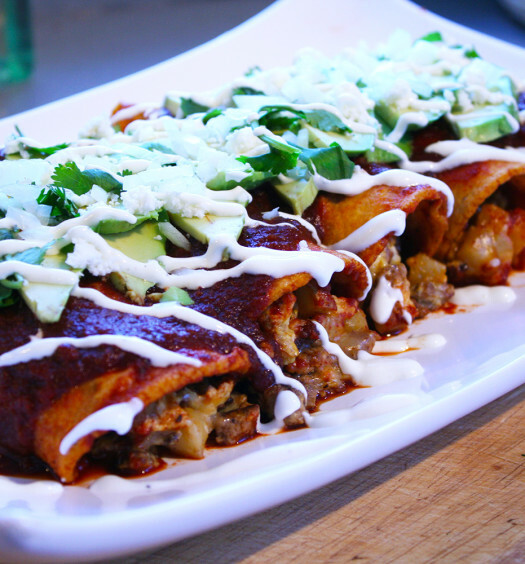 I used dried pasilla and chipolte peppers vs. guajillos. And instead of regular sugar, I’ve used mexican raw piloncillo sugar. It came out pretty tasty. Enjoy. Heat a large cast iron pan or dutch oven over medium heat. Toast dried peppers for 2-3 minutes, stirring often. Add tomatoes, 1 1/2 cup water, cumin, garlic, 2 tspn salt, 1/2 tspn pepper, sugar, bay leaves and ground cloves. Bring to a simmer, cover and cook for 20 minutes. While the sauce is cooking, slice the pork into 1/2 inch thick slabs. Remove bay leaves from sauce. Transfer to a blender and blend till very smooth. Return to sauce to pan and layer in the slabs of pork. Cover loosely and simmer on medium low heat for 1 1/2 hours. Turning slabs half way through cooking time. Remove slabs to a plate and season with salt and cover with foil. Reserve 1/2 cup cooking liquid to baste pork during grilling. Pour off all but 1/2 cup of remaining sauce. Preheat grill on highest heat. 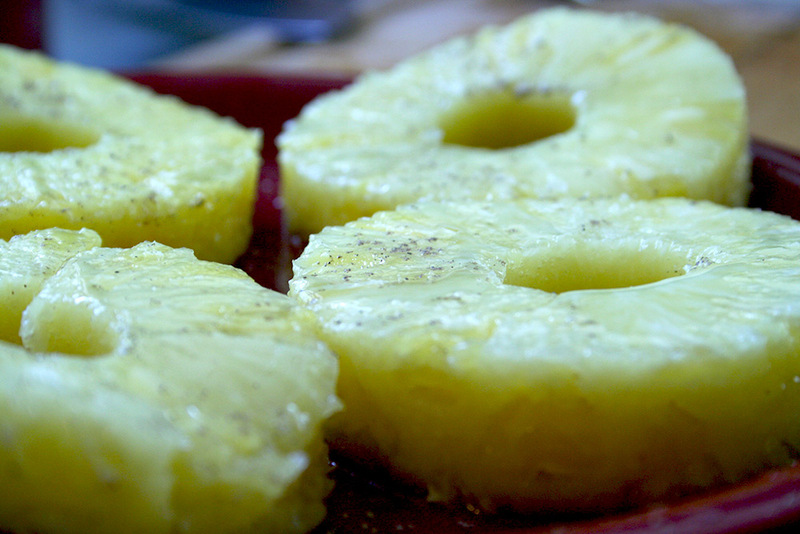 brush pineapple slices with oil and season with salt and pepper. brush slabs of pork with reserved sauce. Turn heat on grill to medium and pork on the grill, sauce side down. Place pineapple on grill. After 5 minutes, baste tops of pork and flip along with the pineapple. Cook another 5 minutes. Add a pinch of salt to the 1/2 cup sauce left in the pan and add and basting sauce left. Squirt a few wedges of lime into sauce. Heat in dutch oven on the grill or stovetop. 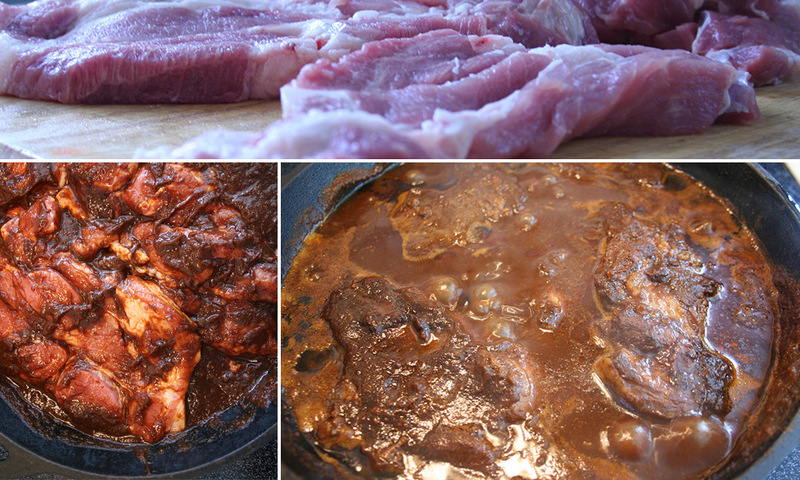 Slice pork slabs and add to pan along with the sauce. Dice 1/2 of the grilled pineapple and add to sauce. Stir. Dice and reserve remaining pineapple to garnish tacos. Reheat tortillas over the grill for 30 seconds or so. Turning once. Top each tortilla with a few spoonfuls of pork mixture. 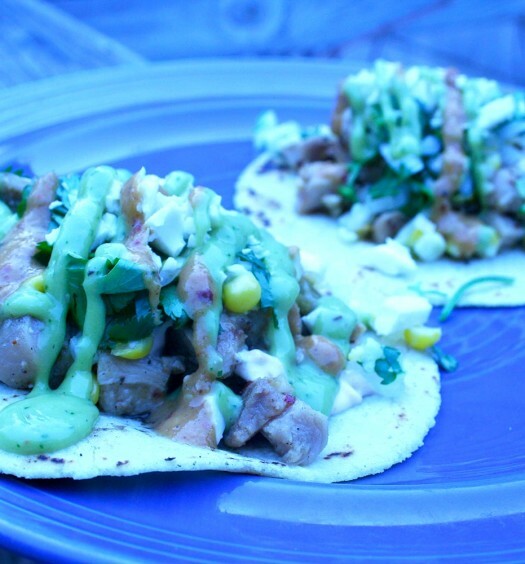 Top with cilantro and diced onions, diced pineapple, queso fresco and some guacamole or avocado sauce. Wow. Pretty good. 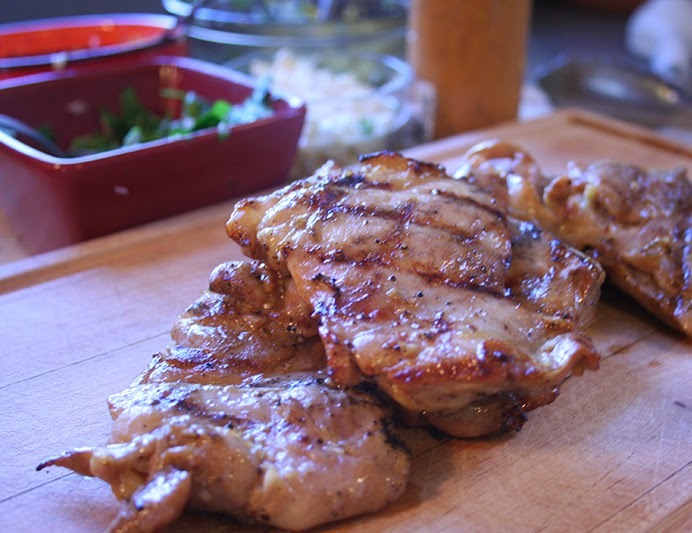 Slicing grilled pork thin and mixing in with sauce.